We planned for a Summer fete but we delivered almost a Town Show, that's the comment from one of the team. What a fantastic event the feedback on Facebook and via email was amazing. The whole event was a huge success, with the 20 charity /community stalls raising well over £1k for their various groups and of course enough for us to expand the Christmas lighting display to MORE THAN DOUBLE last years. We estimated for about 1k to 1.5k people. We think we had about 3.5 to 4k people. We had 500 programmes printed and ran out at 12:15. The fayre only opened 2 hours earlier! Leigh Brewery who supplied the beer, ran out of ale twice! The hot food stall holders ran out of food around 3:15 as a further 2 stall holders could not get to us. We had over 100 favourable comments on our Facebook page from all manner of folks the majority of which what it every year. Well the flower baskets went up at the end of May 2018 following a prolonged period of overnight frost which delayed them being installed earlier than planned, but wow don't they look great. The watering of these was undertaken by the folks from Hadleigh farm training centre and our own volunteers. Did you see the Echo newspaper article in July? 14th March - Received a donation of £500 from the Hadleigh Gardening Assoc today towards the Flower baskets. A huge thank you to all the members of the club. Plus - the Echo newspaper ran an article on us today. 9th March 2018 - Emma from Revelation Arts Hadleigh has kindly set up a Easter bunny hunt. Applications from her shop @252 London Rd , next to Alpine Insurance. The completion runs from 13th March to 13th April. Further details are on our Facebook page. 7th March 2018 - Announcing our Spring Gardening fete on Sunday 15th April @ The Old Fire Station. All things gardening, inc massive plant sale, so grab a bargain to brighten up your garden. See poster attached for more info. 7th Feb 2018 - Meeting with Salvation Army Hadleigh Farm to discuss funding and maintenance of Flower Baskets. This what the Hadleigh Community Group is all about working with the community, to improve the community for all. 25th Jan 2018 - Application to Castle Point council for Summer fayre in John Burrows Park on Sunday 2nd Sep, with accompanying 45 page Event Management plan covering things like First Aid, Security, litter and Evacuation measurers etc. 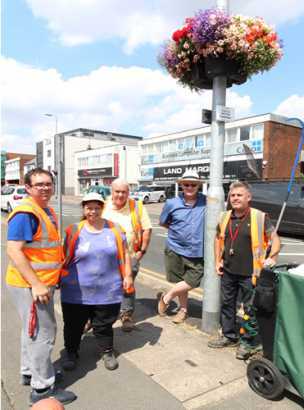 12th Jan 2018 - Grant application to the Big Lottery fund for capital expenditure for Flower Baskets and 10 more Christmas Street lamp decorations. Job Done Sat 2nd December 2017. Hadleigh Christmas Lights switched on. Saturday 4th November 2017 - An artistic cup of tea anyone! A quiz with a difference as all the questions are comedy related. Reserve your place by using our contacts page at the end of the web site listing. What a great night everyone had, it was non stop a Whooping and a Hollering with lots of do-si-do's and a little Yeeee Ha thrown in. A huge Thank You to Helen Goodwin who organised the event to raise funds towards the Hadleigh Christmas lights. Helen's husband Geoff contributed a further £200 from Castle Motor company. Thank you both. Sugar Lump Lane - Vintage afternoon tea for four people. Castle Motor Company - Car MOT test X 2. Hadleigh Hand Car Wash - Luxury Car Valet and polish worth £35. MEZ Restaurant - Meal for 4 people. Masion Noir - Afternoon tea for two. Atlantis Beauty - back massage. Leigh Studios - Landscape Picture. Hanna from Western Dance centre - Dance lesson. Efe Barbers - Turkish Clean shave. Hadleigh Hand Car Wash - Car Valet worth £15. 10th Sept 2017 - Special thanks to Ann Bean for holding an afternoon tea event during which all were shown around Ann's collection of vintage advertising & collectables; during which £130 was raised towards the Christmas Lights. A huge thank you to Ann and her family for doing this. A Barn Dance is planned for Saturday 23rd Sept at the Western Dance Centre Hadleigh. A fish and chip supper is included in the ticket price of £25 per couple or £15 each. The centre has its own bar and a raffle towards the Hadleigh Christmas lights is planned. Both Geoff & Helen Goodwin are contributing to our Christmas Lights campaign. Geoff who owns Castle Motor Company in Oak Rd south and Helen who created Hadleigh Hats. The event is being organised by Helen and her daughter Hannah, during which a raffle will be held and Geoff is contributing a free MOT. Tickets are now available from either Castle Motor company in Oak Road South or AMOS Estate Agents. A quiz with a difference – all the questions relate to Comedy so it will be a night of laughter and fun – who cares who wins, it will be a good laugh. Saturday 28th October 2017 at the Conservative club Hadleigh, who are giving us use of their facilities for free – Thank you. Further details nearer the date, but tables will be a maximum of 6 people, so if you want to reserve a table now drop us a line via our web sites contact page. Emma at Revelation Art is planning an Afternoon tea and pottery painting for all. Planned for Saturday 4th November 2017. This is an ideal opportunity for your children to produce a unique Christmas present for their Grandma and Grandpa and at the same time enjoy the company of other local residents who have children in the area. Further details form Emma at Revelation Art – near Domino’s Pizza.